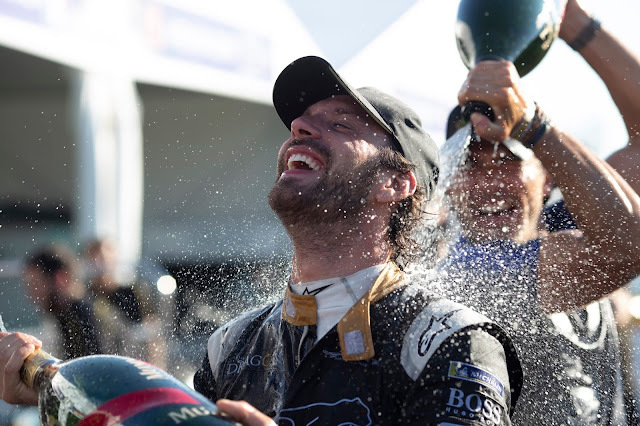 Having wrapped up the drivers championship during Saturday's action in New York, Jean-Eric Vergne turned his attention to helping his team capture the constructors championship. It would be a fraught battle though, as the fast-charging Audi's were now a real threat at a circuit that seemingly suited their machine. 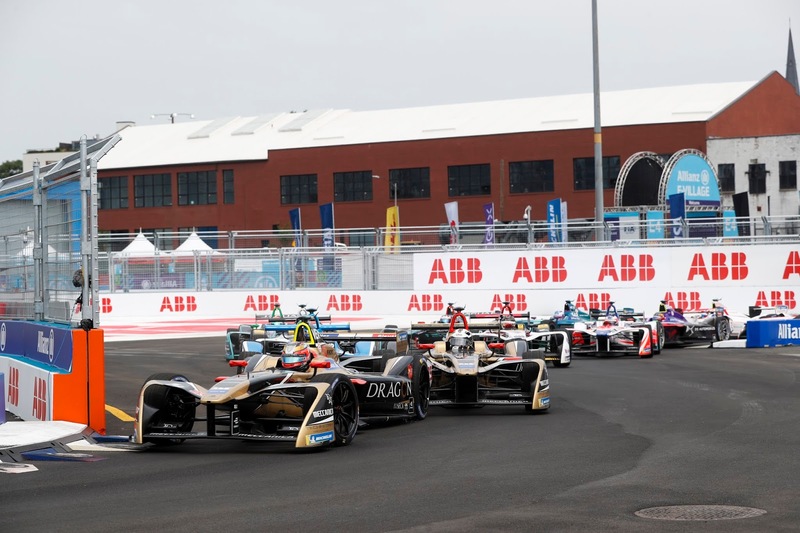 Group qualifying for the second race of the NYC ePrix was a highly uncertain affair, with the track drying but rain and weather in the area, teams were faced with making difficult set up choices using inadequate information. Group 4 looked to have the advantage in terms of track evolution, but only if the rain stayed away. From group 1 it was Sarrazin that impressed, though his 1:19.017 was certain not to last through the drying track. But it was Ma Qing Hua, standing in for the injured Oliver Turvey who managed to hit the wall before the start of his 200kWh lap and pit his steering seriously out of kilter, crabbing the car all the way round the track with the steering wheel almost 90 degrees off level. Group 2 was the championship group featuring all but Lotterer from the tilt for the Constructor's Championship. di Grassi went P1 from the group, followed by Buemi, who drove a very clean and cautious lap, then Abt, Vergne and Bird, who was significantly off the other 4 but still faster than anyone in Group 1. By time the third group kicked off the track was significantly drier than when qualifying started but the radar was telling a different story than the forecast, with a large storm looming just off the shore over NJ and rain looking like it was heading back into the area. Both Dragons did well out of this group with d'Ambrosio going P7 only to be displaced by a hundredth by his teammate Lopez. The surprise of FP3 for rocking up in 3rd, D'Acosta, however barely made it out of the pitlane before his Andretti ground to a halt with gearbox issues. He had stopped early and complained to the team during practice and they had found nothing. His frustration with the situation is evident as clearly his car had the pace and he felt that they should have been able to head this off. Evans in group 4 looked to be a good shout for the super pole group but at the start of his lap he tapped the wall out of turn 1 and lost too much time in S1 to get in. He did run a strong P6, followed by his teammate in P7 but it was Andre Lotter who did the business, taking his Techeetah into P3 and ditching Sam Bird and Virgin from the fast five. Vergne was first off the line, and is run was mesmerizing, as he turned in for turn 5 he brushed the wall close enought to tear the hustings, lighting up the first 2 sectors but losing some time in the third, oversteering through the last turn and just missing the wall as he crossed the line with a 1:18.031. Next up was Daniel Abt, who was slower than his teammate in group qualying and looked to be well off, losing time to Vergne throught the first 2 sectors after he picked up wheelspin on the other side of the hairpin turn 1 and failed to gather momentum for the early part of the lap. But he made up for it in Sector 3 and even though he couldn't topple Vergne from the top of the ladder, he still wound up just a tenth off pole and still in the running for a front row start. 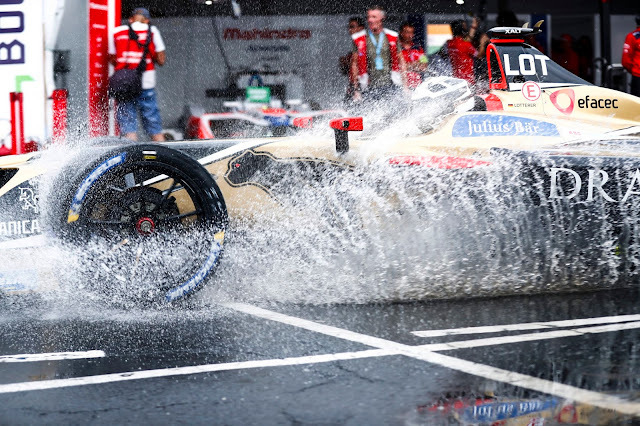 Andre Lotterer followed, no stranger to the damp and he put his experience to good use, not quite as fast as his teammate through the first part of the lap, but close enough that his third sector put him over the top and into provisional pole. With di Grassi yet to come, and 3 points in the Constructor's championship on the line, the tension was ratcheted up as Buemi took his turn. As with his first lap, Sebastian drove clean, leaving nice margins to the barriers and, unlike Lotterer, very little sawing, just an occasional twitch when he got on the throttle a bit early. But, even with no purple sectors, his approach was clearly the way to go as he crossed the line with the fastest time of the day, 1:17.973, unseating Vergne, as all eyes turned to see what rabbit di Grassi could pull out of the hat. Around the hairpin, out of turn 1 he came and into the braking zone for turn 2, just a bit hot, then he locked up over the painted lines, made a desperate attempt to drift his way through the corner but straight into the barriers he went. And so to the race with Buemi for Renault on pole, followed by Lotterer and Vergne for Techeetah with a 5 point lead over Audi, starting directly behind them with Abt and then di Grassi. Vergne leads the pack into turn 2 having had what seemed to be a jump start, especially as his team-mate Lotterer most definitely had and was later penalised for it. At the start of the last race of the Generation 1 cars, one could be forgiven for not knowing that there was real money on the line, such was the focus on the drama of the Driver's Championship which was wrapped up yesterday by Jean-Eric Vergne and Techeetah. But there were indeed a number of cash paying positions up for grabs as the cars rolled off the dummy grid and into their start positions. Including Techeetah's, the customer team made good, sitting atop the pyramid but by a scant 5 points over manufacturer behemoth Audi. Offset by Buemi on pole, as the lights went out it was immediately Vergne diving to the outside of Buemi, who shut the door hard. Such was Vergne's momentum he switched back over and up the inside into turn 6 taking first place. Behind, his teammate Lotterer had managed to keep himself intact and as they launched down the back straight, it was first blood to Techeetah, as Daniel Abt had dropped back to P6 through the melee of the dogleg complex which was the first obstacle the drivers faced after leaving the start. Buemi locked up heading into turn 11 and avoiding him Lotterer got a love tap from di Grassi, but managed to stay ahead as they rocked it down to the turns 13 and 14. But worse lay ahead as already on the radio Lotterer was being dinged for jumping the start, flagrantly so once the replay hit the airwaves. By the third lap BOTH Techeetah cars were under investigation for that infraction and off to the races they went, doing their best to put as much time between them and the rest of the field as they could, before the stewards lowered the proverbial boom. Lotterer took Buemi to the cleaners into turn 11 on the 5th lap, while di Grassi was letting the elastic stretch on the straights, then going deep on the brakes and making the time right back up. And then, just 2 laps later, everyone lost their collective minds. First, into turn 2 Jose Maria Lopez, who had already broken the suspension of his Dragon on the kerbs once this weekend, managed to do the same thing all over again, trying his best to limp it back to the pits, but giving up as the rear wheel slowly detached itself from what was left of the axle. While that was happening, D'Acosta was trying to defend from Filippi as the hustled towards turn 11. A vicious move from the Andretti driver, who was already steaming thanks to a 10 second penalty for replacing his gearbox, took the nose off the Nio of Filippi and sent him hurtling across the track and into the completely unsuspecting D'Ambrosio, putting both Dragons out for the second straight race and ending any hope they had of surpassing NIO in the Constructor's. To add to the drama the stewards had rendered their verdict on Lotterer and it was harsh indeed a 10 second stop and go as the full course yellow was called to remove all the stricken cars. The lengthy delay was more likely due to needing to sort our Vergne, who, just a single lap later was cleared of any wrongdoing. Still, it was enough to keep Techeetah from leveraging any impending Full Course Yellow and having Lotterer save some time serving his penalty. And it was costly indeed, demoting him to 15th place, behind Ma and nearly 30 seconds off the lead and 20 seconds back of the points when he served it on lap 11. 2 laps later and the strategic situation worsened for Techeetah as di Grassi snaked his way by Buemi into T11, the Audi so much later on the brakes than the Renault. With Lucas behind Vergne and the fast lap flag planted firmly in Audi's camp things were starting to look a bit desperate from Techeetah's end. Then Audi pitted Abt on lap 23, one lap prior to the rest of the lead pack, despite him insisting that he was told during the race he was on the same strategy as the rest of the lead pack. The move worked from a strategic point of view as it did move him ahead of Buemi, but it put him in a energy deficit of about 4% to the rest of the leaders, which meant his back would be up against the wall at the end of the race, as Buemi would have extra energy to expend while he needed to lift, coast and conserve. Mahindra's battle was turning in their favour as well, with Rosenqvist now in front of Evans for P5 and Heidfeld P7 while Prost was barely hanging on in the points for Renault, averaging down Buemi's P4 and keeping Mahindra ahead on track for the moment. Buemi, not one to mess about, changed that back to P3 with a nice pass into turn 11, a popular spot today for passing. With Lotterer making the redemption drive of his life and closing in at nearly 2 seconds a lap the championship battle was very much live, although later Abt would insist he had no idea from the team that the spot he had yielded to Buemi was that important. 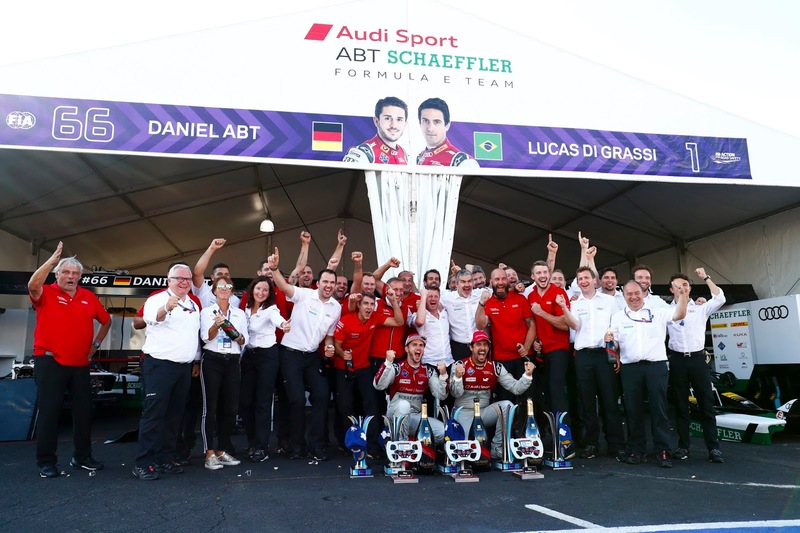 For the moment though, the other prong of the Audi strategy, which was for di Grassi to close on Vergne and be right on him into the pits had been derailed in the actual car exchange, in which there was a "mistake". Nevertheless, the Audi seemed to have some pace over the Techeetah and by lap 33 Lucas was within 1 second of Vergne, and being told that the championship looked good, began to pressure the Techeetah driver, to see if he could find a weak spot in his armour. But JEV was resolute and so began an astonishing, 10 lap running battle that was riveting to watch, as the Audi tended to make up immense ground into the braking zone and corner entry, only to see the Techeetah continually with slightly better exits stretch it out just enough to keep the contest rolling another lap. Lotterer meanwhile was doing his best to atone for his mistake, but Techeetah would need some help from Buemi. Unfortunately for them, a rare mistake and lockup from the Swiss driver allowed Abt back through and with possession of 3rd place and fast lap, there weren't enough laps left for Lotterer to close on Heidfeld for 8th. And even had he caught him, a tie would've been the best they would've done. As the laps closed down, di Grassi got ever more aggressive, and on lapped traffic began to trouble the leading pair, first D'Acosta who had a drive through for causing the earlier collision, who pulled completely out of the way, but nonetheless wound up opening the door a bit for di Grassi. By lap 37 the Audi driver was riding the rear wing of Vergne through every turn practically, and when JEV lifted and coasted into T14 the Audi literally shoved him through the apex. Buemi was moving closer and by lap 41 was within a second of Abt while JEV was putting up an increasingly stout defense when they came upon more lapped traffic which they caught most unfortunately at the turn 1 hairpin right at the start of the 42nd lap. This opened a gap for Vergne that Lucas seemed content to maintain and then all eyes were on Buemi, who was doing his utmost to maintain pressure on Abt. But there were no more mistakes to be made on the Audi side this day and as they crossed the line and caught the chequers, it was team Audi taking the Constructor's by just 2 points, 1 of them from Abt's fast lap. Or you could look to Buemi's pole depriving Techeetah of 3 points in the morning. Regardless, it's all coulda woulda shoulda at this point as the Generation 2 chassis, a newer and more powerful RESS and a brand new set of rules is about to grace next year's Formula E championship. The only thing certain is that no-one is entirely sure who will be where, when they turn up in Valencia for testing and even the most well funded manufacturers are hedging their bets until the tyres hit the pavement. The man of the hour Jean-Eric Vergne turned in another stunning and resolute performance to win the second race of the weekend.